Please share your minds, what's your favorite insoles for extra cushion. Are there insoles that provide forefoot cushion in addition to heel support? 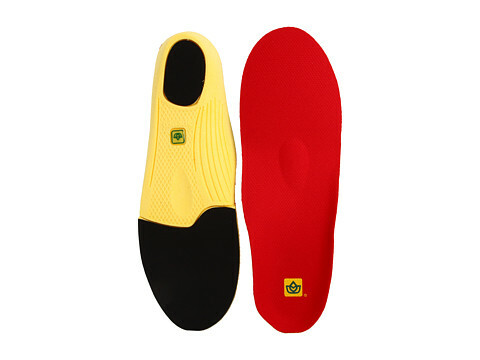 Sof Sole Athlete inserts also provide full foot cushioning. Can't believe no one said "SUPERFEET GREEN" yet, I haven't tried them but in my insoles post people were all about them. Likes: ericg, Raindogs and NE1for10is? Hey, they are not really meant for extra cushion, but for better stability and anatomic support. Actually in addition to reasons mentioned by you I also need extra cushion for my injured knees. Thank you, seems it's a good choice talking quality and price. And I can get it at my favorite tennis shop. I will follow up once my new Footprint King Foams get in (tomorrow I think), they are supposedly the most impressive impact-protection insoles on the market. I use Superfeet Greens and I love them, but the OP wants cushioning. Greens don't give you much cushioning. I use them for support and rely on shoes with good midsoles for cushioning. The Superfeet Oranges are similar but have better cushioning. I didn't pick the Oranges because I wanted a firmer feel. I am being told over and over again, if you have plantar fasciitis,,,,,,,BEST insole out there is Superfeet green. what if you also need great cushioning as well ?? is there anything that has both qualities ?? If there is one that's great at both, it's probably very heavy, just like all cushioning insoles are. The SF Greens are lightweight so they don't slow you down. That's why always look for shoes with great cushioning in the midsole and get my support from the insoles. I never tried Orange in the court, only just walked in them at the store. They feel a lot like the Greens except your heel moves up and down slightly, which is why I went with the Greens. I'm sure the cushioning is better, but I also heard the heel cup cracks easily, probably because of that up and down motion. after you replace the normal insoles with superfeet greens, does the shoes feels shorter or is there still enough room. in other words: if i plan to replace my normal insoles with superfeet greens, should i buy my next shoes a half size larger ? Thank you, i check these insoles, seems they're great though quite expensive. My main problem with legs now is sick (injuried) knees. So i have to get some extra cushion. Never before i worried about cushion, all my tennis shoes are low to the ground with minimum cushion - i use New Balance 996. Try Spenco Polysorb Runner. I use them with my Adidas Barricade Court and they work very well. Just remove the insole that comes with it and replace it with this. I have 2 problems: sore knees if I don't get enough cushioning and sore arches if I don't get enough support. That's why I rely on the shoes for cushioning and insoles for support. Most of the light low to the ground shoes don't have enough cushioning for me. The Asics GR6 is borderline. I'm fine with it most of the time, but if I have a long match my knees start to feel it. Best cushioned shoe I've had is the Prince T22. I'm also having good luck so far with the Adidas Barricade 2015 Boost. I tried cushioned insoles too like the Sof Sole Airr Orthotic. It's one of those with a gel heel and soft all around. The cushioning was great but the support was minimal and the weight makes a performance shoe into a heavy training shoe. I would recommend it only if you can't find a shoe that does all the cushioning itself. I don't have that problem because I have narrow feet. Thick insoles actually improve the fit for me. I think for most people the greens will only make the shoe feel slightly tighter without having to go up a size. If you have big feet, though, it might be a problem. They have other insoles like the blue that don't take up as much space. Thank you for your reply. So you recommend Sof Sole? do you think this is better than Dr. sholl's Sports Gel insoles ? That's usefull advice for me. Also do you think this spenco runner has better cushioning than Superfeet ? orange or green. I have not tried the Superfeet or Kingfoam. I cannot comment on it. Can you link which one you got? I have tried all of them in store. spenco runner has better cushioning than superfeet (any color) but I am not sure you get same stability. In my case, I never worried about stability because never felt any tennis shoes I wore lack in that department. I suggested the footprint insoles(artilage) to Gino and they're absolutely the best material I've ever tried. They may wear out in a month but your feet will feel like they've been running on a fully cushioned surface the whole time. I had serious foot pain for 6 months prior to find those, while using other expensive insoles(with carbon fiber orthotic plates made by my orthopedist to match foot underneath) I still had to come home and soak my feet every night. I came out of a 2 1/2 hour marathon league doubles match last night and my feet weren't even top 5 on my list of sore parts. Apparantly sorbuthane double strikes are used by the marines. Reviews look outstanding. if you look at the trainer insole from spenco it has thick layer of spencore (total 6 layers). True, but stability is compromised compared to the runner. another user of spenco crosstrainer. I used factory insole for few months before they flat out I replace them with spenco trainer. I haven't found any stability issues with trainer. different strokes for different folks....I am glad Spenco has that covered. Nobody mention Sidas and Scholl as good? Are they so poor? The Scholl's gel just seems squishy, and my heel always seems to be "on the move" within the shoe. That, and it never helped in comfort. Might be good if you are standing in the kitchen or behind a retail counter 8 hours a day.